Explore how prototyping can help to improve your Enterprise workflow by enabling you to define, manage and validate your project’s requirements. Building and maintaining a powerful Enterprise framework or flow impacts the outcome of the whole project. By breaking down a project into phases, we can better understand what needs to be done, when it needs to be done by and who it should involve. And, by building prototypes, we can test whether or not the flow of our project is smooth. With a comprehensive prototyping platform, we can manage our requirements across cross-functional teams and involved parties to define web and mobile app solutions more efficiently. At the very beginning of any project, it is essential to have requirements out in the open, and get everyone – stakeholders, business users, UX teams and business analysts – on the same page, in order to get a better insight into their assumptions before offering any kind of solution. Involvement from stakeholders can result in improved productivity and requirements gathering, properly directed development efforts, less rework, and faster implementation, because by knowing what your stakeholders need, you can deliver the results they expect. 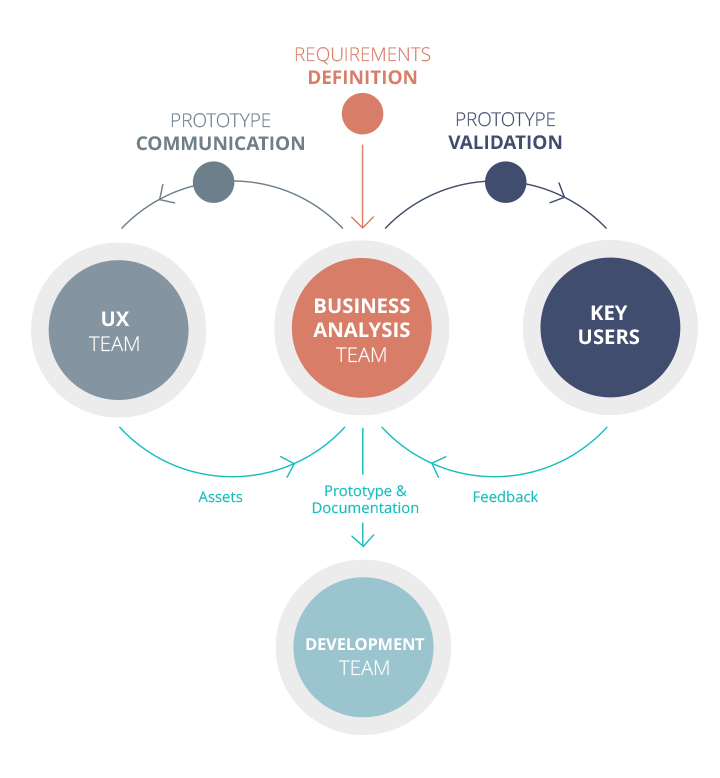 The first step of any software or web development project should be for the Business Analysis (BA) team to define the product’s scope and specifications with stakeholders by gathering functional and non-functional requirements in order to formulate concepts, make recommendations and ultimately define leading edge solutions based upon sound analysis. Yet more often than not, this turns out to be a succession of endless meetings with business teams that don’t lead to solutions. By engaging a prototyping tool that helps you to visualize your requirements early on, assess the needs of your project and react accordingly, this type of set up can be avoided. Prototypes allow you to define requirements, features and functionality, and determine what is absolutely necessary for your project. Once you have defined your project’s requirements with the business users and stakeholders, the next step is to document these requirements with clarity, in order to bring them into reality, eliminate ambiguity, and enable everyone involved to fully understand the objectives of the project. Usually, a visual representation works best because everyone understands the principal concepts and you can organize your project efficiently for maximum impact. Communicating and translating your requirements with a Prototype makes it easier to visualize your ideas and make design decisions because everything can be seen and shared even before the application is built. For a large project that has many cooks in the mix, a prototyping tool that allows you to start off with basic mockups and wireframes and built up to high-fidelity and high-resolution prototypes could be a good idea. Streamlining your workflow and fostering global collaboration across all teams, and with external stakeholders, is an essential step towards a successful and innovative software project. Remember, before you invest in costly development, reviewing and testing your UI design with stakeholders and representatives from your user group is an important step. First, we define the problem, then we research solutions, and then we wireframe and iterate design possibilities. But, before we get too deep into a potential solution, we need to make sure that our team has the same understanding of the problem and the project. This is why it’s important to work with a prototyping tool that allows teams to work simultaneously on assets creation. and maximize your enterprise flow! When it comes to validating requirements, all relevant Business Users and Stakeholders should be involved to give their feedback on a variety of criteria, such as the completeness, viability and measurability of the solutions related to their initial requirements. In large enterprises, user feedback helps us to make informed design decisions where we can’t ask our customers directly for what they’d like to see improved in our flows, in order to reach common businesses goals such as improved conversions and user engagement. It is impossible for a designer or a product manager to sit in a room and guess how a customer wants to use a feature/product. Like Quality Assurance testing benefits developers, user testing helps designers and business identify design & product vision issues. The benefit is that they are identified early on and not after you go ‘live’. It also helps reduce rework cost & minimize low Return On Investment on feature development. And remember: the earlier an error is detected, the cheaper it is to correct. Once you’ve performed user testing with your stakeholders, performing iterations of your prototypes allows you to tweak your designs in accordance with their feedback. With the introduction of interactive and high-fidelity prototyping, we’ve seen a more efficient handover of deliverables to stakeholders. Basic iteration proves that we can get to a closer approximation of the final deliverable if we repeat the process incrementally. The final step within the Enterprise Prototyping workflow is to document our process. Documentation, in the form of expansive specification documents, is often the primary deliverable to present to clients before development takes place. However, documentation can be inflexible. We’re now seeing teams transitioning from documentation to prototypes as final deliverables. Using a prototype to document your process and present to clients and stakeholders allows for greater interaction with the product and a deeper-level understanding of how the product is experienced, by all – people know how to interact with products. It’s time to move away from heavily documented handoffs to a process based on rapid, collaborative prototyping. With Justinmind, you can build the perfect Enterprise project flow by deploying a comprehensive prototyping platform. Define, visualize and customize your requirements, explore the powerful collection of pre-defined drag & drop UI assets and customizable widget libraries that empower your team and stakeholders to give their feedback, and validate your prototypes and gather feedback by publishing and sharing your Justinmind prototypes online to get immediate feedback from all parties involved. Additionally, you can integrate your prototypes with user and usability testing tools and perform user tests with tools such as Validately, in order to get input, iterate and validate your prototypes with Justinmind. When it comes to software engineering, your job is to build a reliable, understandable, and stable system. To reduce a problem to its simplest essence and build the solution. Nothing more! This is why we prototype before we develop. Try out Justinmind Enterprise today and see how Enterprise Prototyping could benefit you, your team and your stakeholders.